We spent most of our day driving from Windhoek (Namibia) to Maun in Botswana. It's a helluva long drive! Apparently (and I'm trusting our guide here), Joburg to Cape Town, Cape Town to Windhoek and Windhoek to Maun are pretty much the same driving distance. We spent the night in a campsite here before setting off to the Delta the next morning. 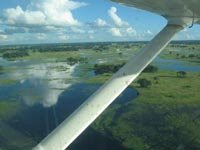 The Okavango Delta is an amazing place. Sadly we were there in their rainy season and didn't get to see that much wildlife on our walks around (because they weren't confined to specific watering holes due to the abundance of water). I was particularly sad not to see any hippos as we floated by Mokoro to our campsite. Sadly the camping was not ideal. Firstly there was no toilet (this was deep in the bush, my dear!) and secondly it rained almost solidly for the 2 nights we were there. 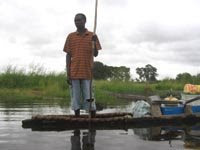 Today we headed out of the Delta and back to our Maun campsite. We were lucky enough to have a flight over the Delta before we moved on tho. The views were more spectacular by air and we saw far more animals this way. I definitely wanna go back someday. Probably with a touch more luxury (they have some amazing lodges, I've heard!) and when it's less wet, in the hopes of seeing more wildlife. We spent a night in the Chobe National Park on our way up to Victoria Falls. 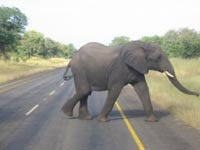 It's an interesting place because their national roads go literally straight thru the park and as you can see from the photo, the animals just don't care. Sadly it wasn't a very good night for 2 members of our tour. We'd been told that crime was rife in the area because of it being very closer to the border of 4 countries (Namibia, Botswana, Zambia & Zimbabwe) ... which makes it much easier to escape. So in light of this news, we all locked the bulk of our stuff in the van we were traveling in and kept the bare minimum and most important items (passports & cash under our pillows at the far end of the tent!) with us in the tent. And we had a break in and two bags were stolen. And they'd left their cash, passport & camera in their main bags. So while we went for an early morning game drive before heading across the border to Zambia ourselves, they struggled with the local police and applied for emergency passports. One of the little known facts about Botswana, other than the fact that they are the only Southern Africa country with a better exchange rate than South Africa (amazing in itself! ), is that people are outnumbered by donkeys. Which is why this is one of my favourite photos (cropped for blogging purposes). 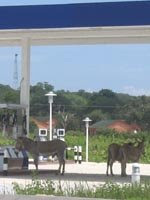 The donkeys are all crowded in the shade of a petrol station. And there were no cars vying for position either. A different form of transport "re-fueling" - pahahaha. Okay, I thought it was funny!